Hello my friends! I have been slightly delinquent with Flashback Friday the past couple of weeks and for this I apologize. I am back in the full swing of things (well at least for a few more days) and felt particularly inclined to share this beautiful picture with you today. So sit back and envision yourself sitting on a white balcony in your quaint little hotel with a warm breeze caressing your face. 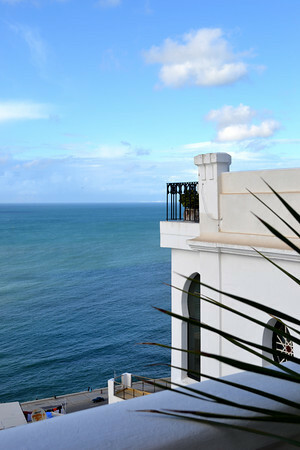 You are located in the beautiful city of Tangier-located in Northern Morocco near the Straights of Gibraltar. You look around at your surroundings and are in awe of the vibrant blue Mediterranean and the stunning melange of Spanish and Moroccan architectural flare. You have just finished your afternoon snack of Moroccan mint tea and traditional Moroccan cookies. As you place your book down on the little table in front of you, you take a long deep breath in. As you exhale all your worries and stresses out, you agree that yes, the world truly is a beautiful place. Have a wonderful weekend and stay tuned for “Serengeti Eye Spy” on Monday. Until then, travel well and travel often! Hello my friends and Happy International Women’s Day! International Women’s Day is a global day celebrating the economic, political, and social achievements of women past, present, and future. This post is dedicated to all the beautiful and amazing women I have met while traveling around the world. Thank you for inspiring me to do more and become a better person. Until next time, travel well and travel often! Hello my friends and Happy New Year! I am sorry for the late posting but the holidays have been very busy and I took an extra day to recover from our NYE festivities! I have also been preparing for my next adventure. That’s right, I am kicking off 2012 by doing the thing I love most- traveling. I will be spending the entire month of January trekking around and discovering Ethiopia! I am so very excited and promise to give you the full details in my next posting. For this post, I wanted to give a recap of 2011. This past year has been an incredible year for me. It was 365 days full of discovery, adventure, wonderment, and travel. I set a personal best for number of countries visited. Grand total? Twenty. Twenty countries, twenty incredible adventures and stories. From the Medinas in Morocco to the beaches in Mozambique I have met amazing people and experienced places I never thought I would visit. I know my life has been enriched by these encounters and I am forever grateful for the opportunities I have been provided. This blog, especially, has turned into another passion of mine and I am very appreciative of your support and readership. The following is a collection of my favorite photos from each country I have visited in 2011. Thank you so much for your support and comments. I love having you by my side as I travel through this beautiful world of ours. I hope 2012 brings you nothing but happiness, health, and of course, travel! Hello friends. I have decided to create a weekly post called “flashback friday.” This post is going to feature favorite photos and vignettes from my travels before I started this blog. Hindsight is always 20/20 and if I had known this blog would be so fun and successful I would have started it when I fist began traveling last April. Before this blog I had already visited some amazing African countries such as Morocco, Tunisia, Madagascar, South Africa, Botswana, Zambia, Mauritius, and the Seychelles. I know…that is a lot of countries! I already have a lot of photos from these countries posted on my photo webpage, but I wanted to give you the stories behind them. So here we go with our first ‘flashback friday.’ I know you all recognize this photo as the header for Bound for Adventure. This is by far one of my most favorite photos I have ever taken. It was taken in Chefchouen, Morocco the day I arrived in this beautiful little village. 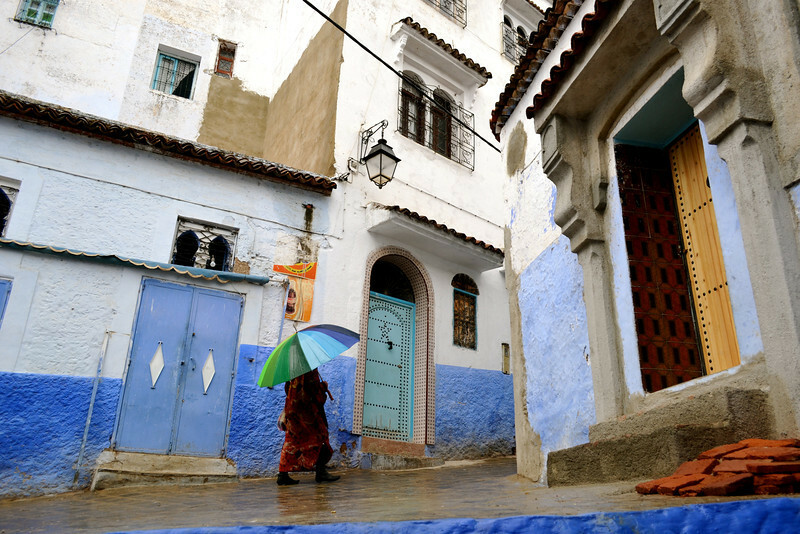 Chefchouen is nestled in the Rif mountains in northern Morocco. The entire village is painted a myriad of beautiful blue hues and it is one of the most architecturally beautiful places I have ever been to. Additionally, the Berber people who live there are incredibly nice. On the day I arrived it was raining and a bit chilly. I had just checked into my charming little hotel, Casa Perleta, and despite the weather, couldn’t wait to explore the little village. I returned a couple of hours later and was walking down some steps to the entryway of my hotel when I saw this woman walk by. The colors of her umbrella against the backdrop of blue walls was visually stunning. I quickly snapped a photo and it wasn’t until I uploaded it onto my computer that I realized how amazing it turned out. It was one of those “one in a million” photos for me. I decided to make it the header for this blog because the woman looks like she is walking with a sense of purpose and beauty. She is on her way somewhere, either home, or perhaps to some far off adventure. To me, this embodied what Bound for Adventure was all about. I hope you enjoy it as much as I do! Where did I just come from? Catch me if you can….